The Get on Board Competency Pathway for Trustees has been developed by the ICMGR at Edinburgh Napier University Business School. The intention is to make an impact by developing a competency pathway to encourage and support the first talent pipeline for Charity/Social Enterprise board members. Additionally, to map and support the vibrancy of the Board Governance eco-system. The Get on Board Competency Pathway for Trustees is made of three levels: bronze, silver and gold. 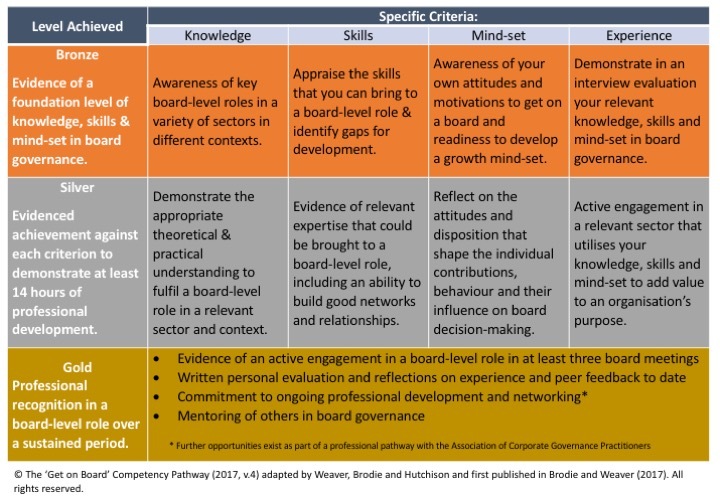 Each detail the learning outcomes that need to be demonstrated for each level of achievement broken down into the Knowledge, Skills, Mind-set and experience that a board member should develop and demonstrate (shown below). Followed by some guidance on how each participant can demonstrate the specific criteria (see detailed document – link below). The Charity Board Initative, a partnership between RSM, Santander and Edinburgh Napier University will offer a pilot in Edinburgh for students at Edinburgh Napier University and Edinburgh University and act as the accrediting body. The full details about the competency pathway and eco-system for Board Governance in Scotland can be found here.